How Flexible is Rigid Plastic? HomeBlogGeneral Plastic ExtrusionsHow Flexible is Rigid Plastic? a) Is rigid PVC (uPVC) as stiff as metal? b) Can rigid profiles bend around a radius? c) Is plastic sheet rigid? d) Why don’t Tubeway stock many flexible profiles? Let’s start with a quick discussion, based on PVC, a very common plastic. PVC is flexible, because it contains plasticisers which keep it that way. The plasticisers are usually phthalates, which are chemicals that can harm various human organs if ingested in quantity, and they can leach out of PVC over time, hence PVC for teething rings and other things a child might put in their mouth being restricted. It is used (safely) for products like clothing and industrial strip curtains. uPVC (or PVCu) is different as it is unplasticised, which makes it rigid. uPVC is commonly used in plastic-double glazed windows, for example, and the lack of softening chemicals makes it a foodsafe material posing no known risks to health under normal internal or external use. uPVC has a natural whippiness to it, so that it can flex over a long length, depending on its shape. a) Equivalent thicknesses of plastic and metal are not equivalent in stiffness, as unsurprisingly, the metal will be more rigid. Aluminium Angles, for example, have a common thickness of 1.6mm for this very reason, which is ok for plastic, but certainly not enough to make it truly rigid. The thickness of plastic makes a significant difference to its ability to bend, and as a rule of thumb with Angles, you’ll probably need to double the thickness of aluminium for a similar feel. This is not always an issue though, as if you are using Angles for corner protection, the fact that uPVC can flex a little is good if your wall is out of true, and as for strength, once the Angle is installed for corner protection, the wall itself adds stability and strength to it. b) Given that you now expect your plastic profile to bend a bit, how much will it do so? This will depend on the profile shape. If it is 2 dimensional, such as a thin wide strip, then it will bend easily on the narrow plane, but would not be expected to bend at all on the wider plane as this would require much more stretching or material displacement to do so. 3 dimensional profiles are more of an issue therefore, as there is no narrow plane, so it is harder (though not necessarily impossible) to bend much. The most rigid shape is a square profile, hence box section being used as a support profile quite commonly. There is another aspect that crops up with bendiness, which is when it affects 2 part profiles. The best example is our fine selection of LED mounts, which feature a base and a clip-in lid, which a customer might want to bend around a staircase of curved steps. On anything but a gentle radius, the clipping mechanism is the first thing to be affected by the curvature, and by and large, it ceases to work reliably. One other plastic sheet product that will be familiar is Multiwall Polycarbonate, commonly used for conservatory roofing. It is made with honeycomb compartments and several layers which not only provide great insulation, but also rigidity. d) Flexible profiles have their uses, but as mentioned earlier, you have to be careful how the shape allows bending without stretching or displacement of material – so 2D profiles are more suited as previously described. They give much better bump protection, but are only durable away from the sun, and the way they are manufactured, or more specifically, coiled into boxes whilst still warm, means they can kink or twist. 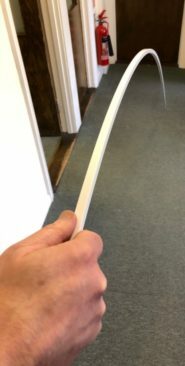 Tubeway are frequently asked about flexible profiles like Angles and Channels, where customers want to accommodate a radius, but haven’t always thought through that the profile will have to stretch or buckle to do this, and in the case of Channels particularly, the grip you expect from the legs (for capping a board end) is missing with flexible material. However, there are still requirements where this is not an issue, so bear in mind that Tubeway can run to order many of their profiles in flexible material, for protection of aero engine cowlings or car body parts in transit, for example.